To achieve this advance, engineers devised new materials processing strategies to dissolve high concentrations of neodymium ions into alumina crystals. 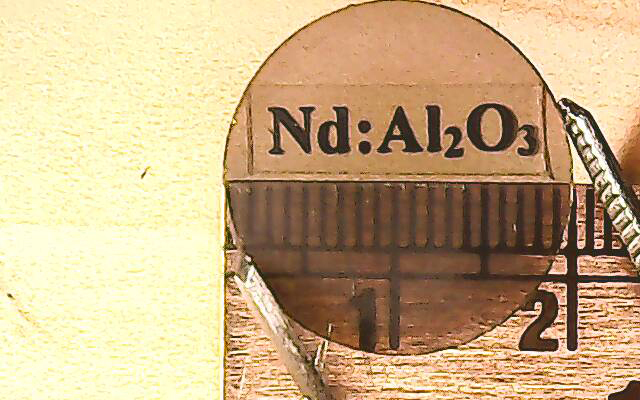 The result, a neodymium-alumina laser gain medium, is the first in the field of laser materials research. It has 24 times higher thermal shock resistance than one of the leading solid-state laser gain materials. The research was published this month in the journal Light: Science & Applications. The team will also present their work at the 2018 SPIE Conference, Aug. 19 to 23 in San Diego. Neodymium and alumina are two of the most widely used components in today’s state-of-the-art solid-state laser materials. Neodymium ions, a type of light-emitting atoms, are used to make high-power lasers. Alumina crystals, a type of host material for light-emitting ions, can yield lasers with ultra-short pulses. Alumina crystals also have the advantage of high thermal shock resistance, meaning they can withstand rapid changes in temperature and high loads of heat. However, combining neodyumium and alumina to make a lasing medium is challenging. The problem is that they are incompatible in size. Alumina crystals typically host small ions like titanium or chromium. Neodymium ions are too big—they are normally hosted inside a crystal called yttrium aluminum garnet (YAG). “Until now, it has been impossible to dope sufficient amounts of neodymium into an alumina matrix. We figured out a way to create a neodymium-alumina laser material that combines the best of both worlds: high power density, ultra-short pulses and superior thermal shock resistance,” said Javier Garay, a mechanical engineering professor at the UC San Diego Jacobs School of Engineering. The key to making the neodymium-alumina hybrid was by rapidly heating and cooling the two solids together. Traditionally, researchers dope alumina by melting it with another material and then cooling the mixture slowly so that it crystallizes. “However, this process is too slow to work with neodymium ions as the dopant—they would essentially get kicked out of the alumina host as it crystallizes,” explained first author Elias Penilla, a postdoctoral researcher in Garay’s research group. So his solution was to speed up the heating and cooling steps fast enough to prevent neodymium ions from escaping. The new process involves rapidly heating a pressurized mixture of alumina and neodymium powders at a rate of 300 C per minute until it reaches 1,260 C. This is hot enough to “dissolve” a high concentration of neodymium into the alumina lattice. The solid solution is held at that temperature for five minutes and then rapidly cooled, also at a rate of 300 C per minute. Researchers characterized the atomic structure of the neodymium-alumina crystals using X-ray diffraction and electron microscopy. To demonstrate lasing capability, researchers optically pumped the crystals with infrared light (806 nm). The material emitted amplified light (gain) at a lower frequency infrared light at 1064 nm. In tests, researchers also showed that neodymium-alumina has 24 times higher thermal shock resistance than one of the leading solid-state laser gain materials, neodymium-YAG. “This means we can pump this material with more energy before it cracks, which is why we can use it to make a more powerful laser,” said Garay. The team is working on building a laser with their new material. “That will take more engineering work. Our experiments show that the material will work as a laser and the fundamental physics is all there,” said Garay. Paper title: “Gain in Polycrystalline Nd-doped Alumina: Leveraging Length Scales to Create a New Class of High-Energy, Short Pulse, Tunable Laser Materials.” Co-authors include Luis F. Devia-Cruz, Matthew A. Duarte, Corey L. Hardin and Yasuhiro Kodera, all at UC San Diego. Penilla will be presenting this work as an Invited Oral Lecture on Aug. 19 at the 2018 SPIE Optical Engineering + Application Meeting within the Photonic Fiber and Crystal Devices: Advances in Materials and Innovations in Device Applications XII Section. This work was supported by the High Energy Laser – Joint Technology Office administered by the Army Research Office.